Ida Hiebert Penner was born near Plum Coulee, Manitoba in 1903, the eleventh child of Jakob and Maria Hiebert, who farmed in the area. She graduated from the high school at Winkler in 1921 and attended Normal School at Manitou, Manitoba until 1922. She also took further summer sessions at the Winnipeg Normal School between 1924 and 1927. She lived around the Winkler area until 1933 where she taught in country schools and attended the Winkler Bible School from 1929-1933. In 1934 she married Isaac Penner. They had 5 children. (One daugher, Mrs. Shirley Bergen lives in Brandon, MB.) She resumed teaching in the Winnipeg area in 1950, continuing until her retirement. In later life she took up painting. Based on article in The Beaver (Oct/Nov 1993). The Ida Penner fonds was donated by her daughter, Mrs. Shirley Bergen of Brandon, Manitoba in August 1995. 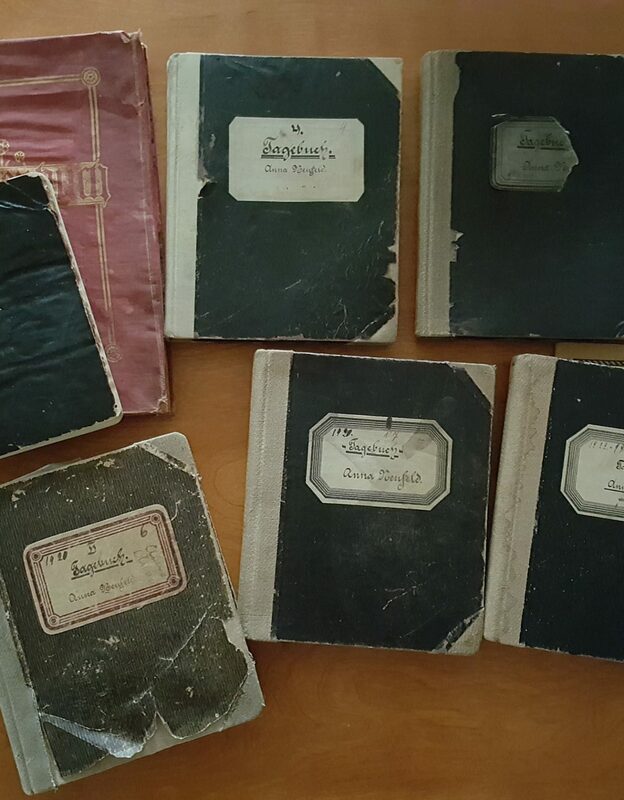 The Ida Penner fonds consists predominantly of her bible school notebooks created as a result of her time at the Pniel Bible School between 1929 and 1933. Also in this fonds is a textbook, published around 1905, used by Penner for her students in Southern Manitoba. She wrote an article in The Beaver in 1993 about those teaching days. The microfiches and diaries of Ida Hiebert Penner, created between 1925 and 1933, are in the microfiche storage area. The photographs of Winkler Bible Institute were added to the WBI photograph collection. See also diaries of Ida Penner nee Hiebert. – 3 microfiches located in microfiche storage area. – 1925-1933. “A teacher at Beautiful Meadow” by Ida Penner. Published in The Beaver, 1993. Die Apostelgeschichte, Bible school notebook. II Teil. Old Testament Theologie, Kosmologie und Anthropologie, Bible School Notebook. New Testament Exegesis: Der Ebräer Brief, Bible School Notebook. Old Testament Exegesis, Kursus der 2. und 3. Klasse (Lehrer J.G.Wiens). – 1929-1930. Homiletik Kursus der 3. und 4. Klasse. (Lehrer J.G. Wiens). – 1929-1930. New Testament Exegesis (Bergpredigt) Kursus der 2. Klasse. (Lehrer A.H. Unruh). – 1929-1930. Beweisführung. Beweis des Glaubens. – 1929. Logik Kursus der 3. Klasse (G.J.Reimer). – 1930-1931. Pädagogik Kursus der 3. oder 4. Klasse (Lehrer G.J. Reimer). – 1929-1930. Bibl. Psychologie. I. Teil, Leibes u. Seelenleben. (G.J. Reimer). – 1930-1931.